Viewing big game representations we have particularly dealt with figurative elements. Here, forms and form findings are dominant. Where, on the other hand, representations of cattle (domestic animals), humans as well as mask people are concerned, we have put an emphasis on the social or everyday life foundation in reality. In the album on devices and signs we’re trying to examine some objects of everyday life as to their function and their meaning. Here, too, we obtain, on closer inspection, useful answers as far as their social meaning is concerned. 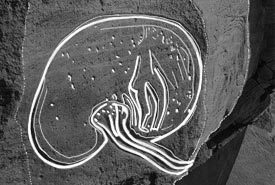 Again, we find the representation of a placenta; we make out trees, archetypical signs like spirals (labyrinths), symmetrical and symbolic forms, snakes, wings, sun wheels as well as devices for catching cattle and other animals, or to prevent their running away, headrests, textiles, hands, tools, vehicles, etc. Saying that, for us today, the intellectual life of those people isn’t easily to be understood, this doesn’t apply so much to tools and objects of everyday life. Those people haven’t simply lived in intellectual spheres and neglected down to earth life, they have had, on the contrary, to deal with practical purposes and problems (in order to survive), and have given evidence thereof in their drawings. Still, we have no knowledge of the contents of numerous rock artworks. For instance, one often comes across a device which one might think of to be a shovel: a longish form, drawn with horizontal lines which seems to be fixed to a handle. What could it possibly mean? A question to which there’s no answer. One also could think of a travois, a transport device of the Plains Indians, which seems to be logic as it occurs where also animals occur. But that’s just speculation. In the end the question remains: how did the habitats of those people look like? In the Akakus and other parts of the Sahara it could have been caves, but in the area which today is part of the Messak Dessert? Of course one thinks about tents without having any obvious leads, while there are indications that they had stone enclosures for their cattle after all.